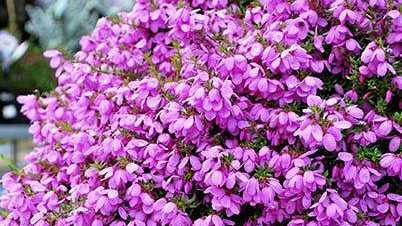 If you would like to introduce some Australian native cottage charm into your garden, Plant Growers Australia has released a special selection of tetratheca thymifolia in the eye-catching Fairy Bells range. They have beautiful bell-shaped flowers starting in late winter and continuing to spot flower into autumn. The neat and compact plants grow to around 40cm tall and 60cm wide and thrive in full sun or part shade in garden beds or pots. Fairy Bells are fast-growing, dry tolerant once established and will attract birds into the garden. They come in a range of pretty flower colours. Another low-maintenance choice to brighten the garden from Plant Growers Australia is the Explosion collection of Lampranthus. They're ground cover plants with succulent foliage that is smothered in flowers from spring to summer. Flower colours include stunning Pink Explosion as well as bright Raspberry Explosion, peach toned Coral Explosion and pastel Mauve Explosion.